Bee hunting season is open! …but she and her offspring(?) or BFF, are fun to watch as they hunt for buzzy meals and sip from the baths. 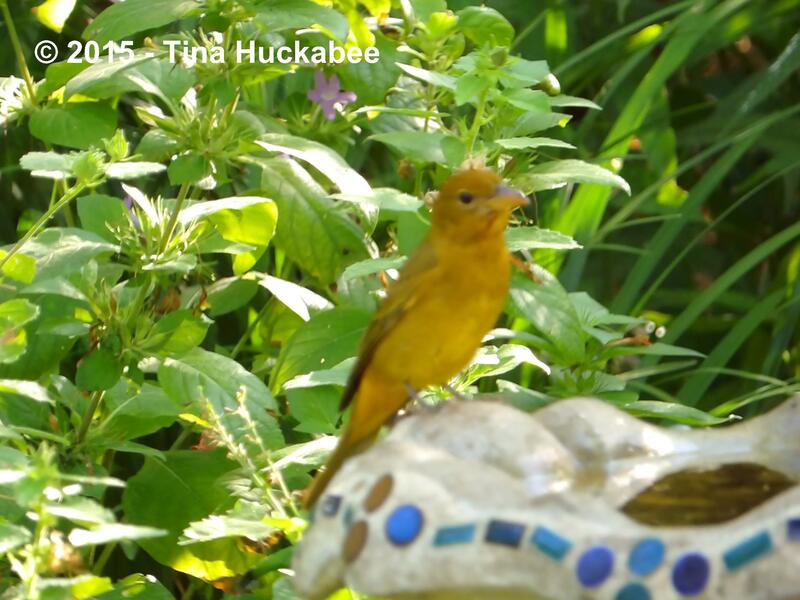 Summer Tanagers, Piranga rubra, have returned to my garden in search of honeybees for their main course and wasps and native bees à la carte, since those insects are also on the Tanager menu. 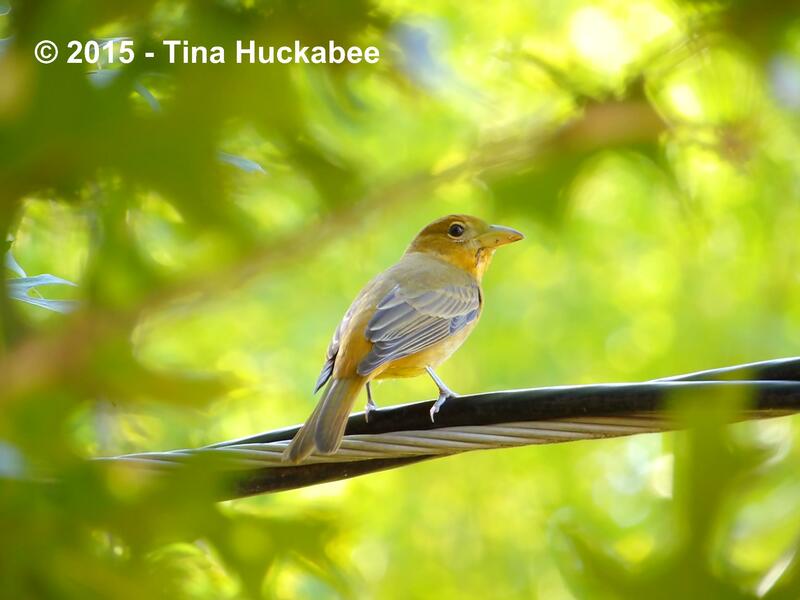 I wrote about the visits from a male, female, and immature male Summer Tanager last May. That crew hung around snatching bees for a couple of weeks. I didn’t spot any Tanager action during the summer months, though they breed in this area. However, this past weekend I saw two females bee-hunting in my back garden. 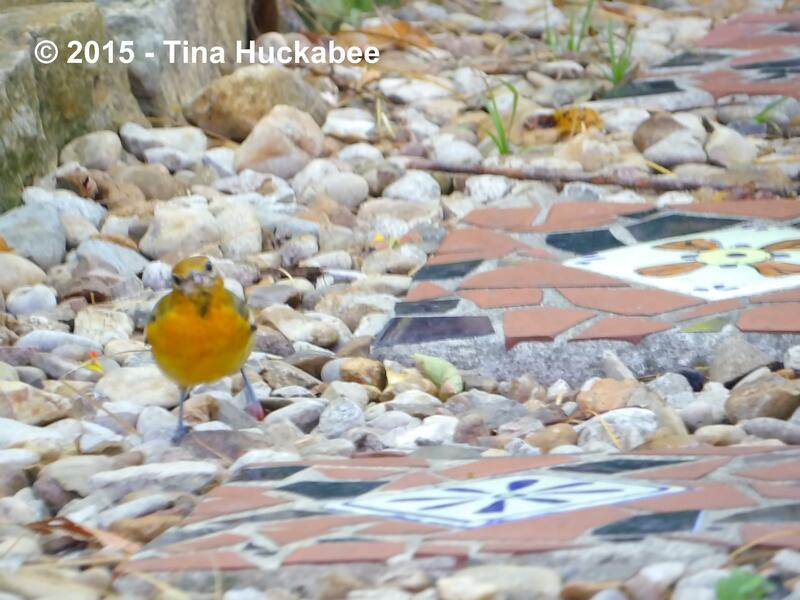 I imagine the two golden beauties are fueling up for their migration to Mexico and South America. I observed as one of them flew to the landing board of my beehive Scar, plucked a bee from its hive, then rested on a branch of the overhanging Shumard Oak. She proceeded to bang the bee on the branch, quickly dispensing it down her gullet when it was sufficiently dead and stinger-less. Another time, one perched on a different branch of the same tree looking rapidly this way and that, as bees buzzed past her on their foraging way. So many bees, so little time! 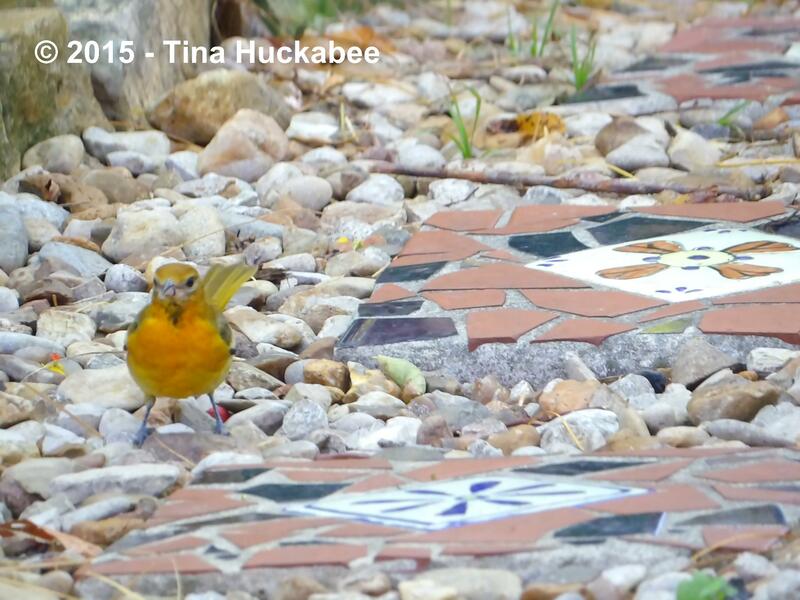 The bees were completely oblivious of the danger posed by the observant, seasoned, and accurate bee hunter. I’m bummed that the Tanagers eat my bee girls and would certainly be glad to offer them a peanut butter and honey sandwich instead, but I don’t think that would go over too well. This one hopped along a pathway, looking for…I’m not sure what. Bees crawling on the ground? Maybe she was eyeballing the big, weird critter in front of her on the pathway, perched on the pink chair–the one with the black eye in front of her face. Okay, maybe that critter isn’t a concern, after all. On to hunting bees! Tank up, Tanagers. You have a long flight ahead of you. 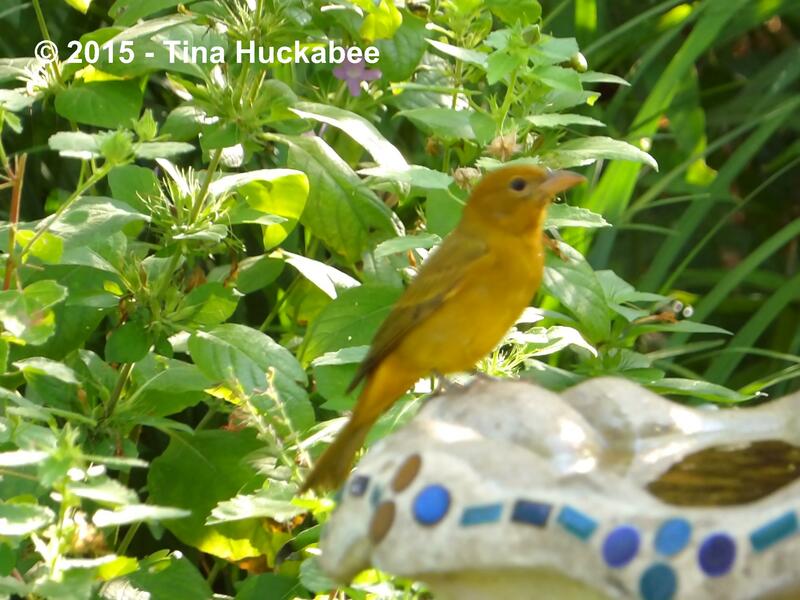 This entry was posted in Piranga rubra, Summer Tanager, Wildlife, Wildlife Gardening and tagged Biodiversity, Birdwatching by Tina. Bookmark the permalink. Ha ha ha! 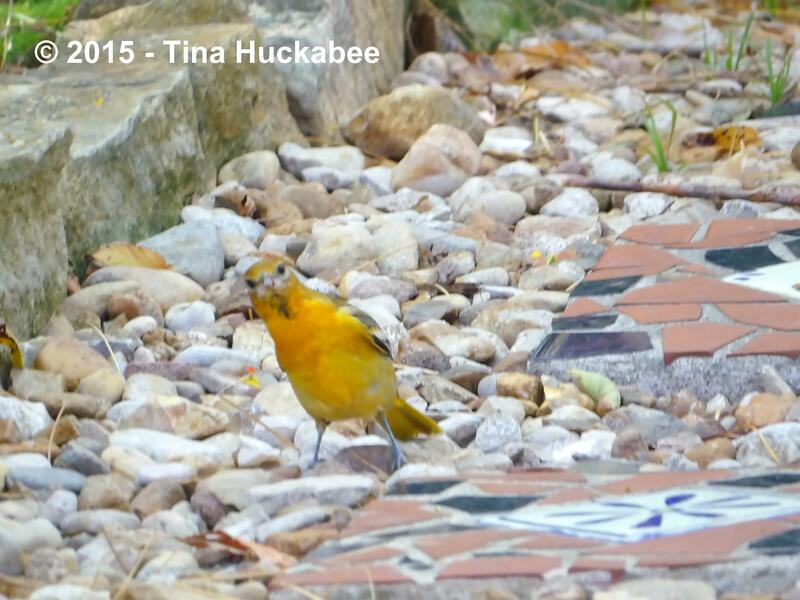 The photos just kept getting better and better… While I am sorry these adorably bright little birds are after your girls, at least the tanagers will be moving on. I’m pretty sure I saw an anole gobble down a honeybee deep in the kidneywood tree. It was lightning quick and there were pollinators of all sizes in reach. I convinced myself it could have gotten any one of 3-4 different visitors, but… I’m betting bees are on the anole menu as well. And anoles are here to stay (though also pretty cute…). Everybody’s eating somethin’! Yeah, nature is definitely a mixed bag, eh?? These birds are so charming. When my coral vine was magnificent (I moved it this spring, it’ll be a year before it’s full again), anoles lived in it and hunted honeybees and butterflies. Yup, everybody eats somebody! Wonderful photos. 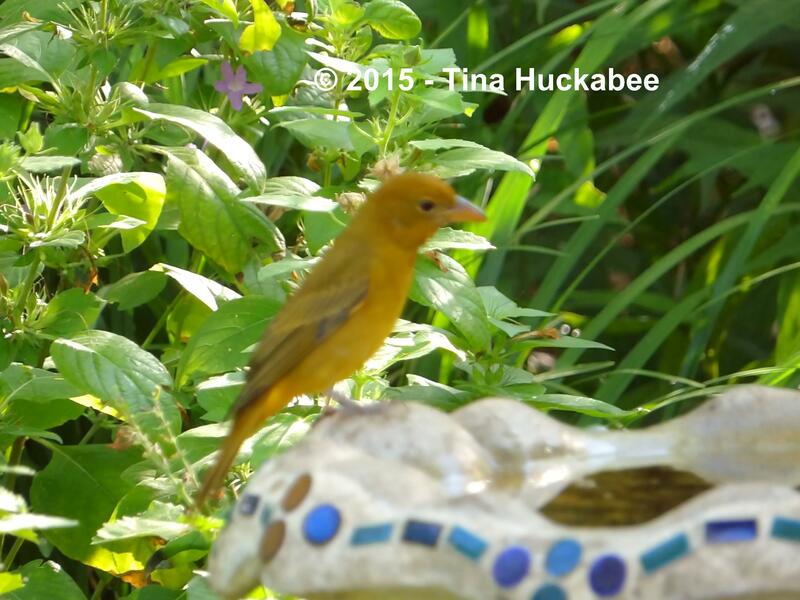 I have the Tanagers visit once in awhile, but never knew they ate bees. Bees, wasps, but also fruit apparently. They’ve been quite entertaining, though they’re not always around. Ah well, what’s a bird to do? She’s gotta eat. I know how you feel. I have the same reaction when I see one of my honeybees get dangerously close to one of the big spider webs around the yard this time of year. But I’m not going to interfere. All creatures have to eat…..
Yeah, I know. All things eat and as I’ve said before, I’d rather the tanagers and spiders eat the honeys than the native/wild bees. The Summer Tanagers are part of that large group that are referred to as “neotropicals”–they migrate back and forth from South America in winter, to North America for breeding. 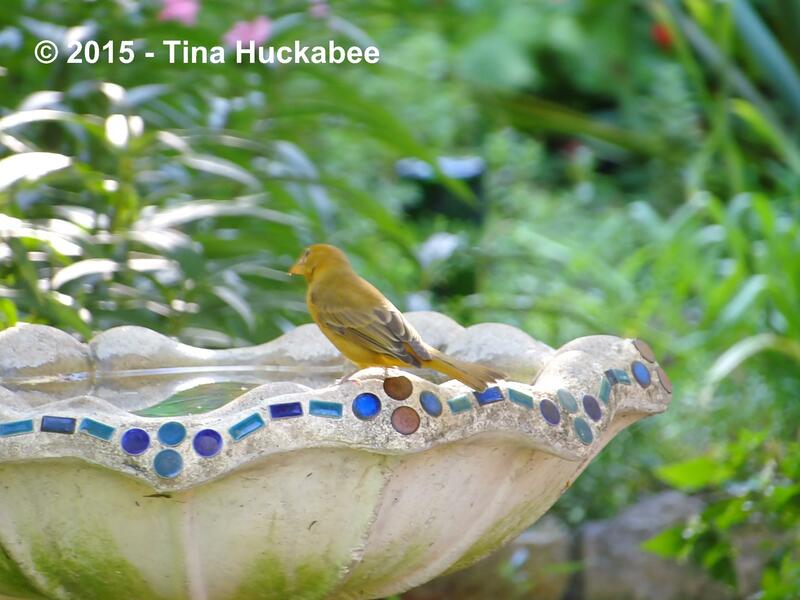 I’d never seen one until I hived our honeybees…. 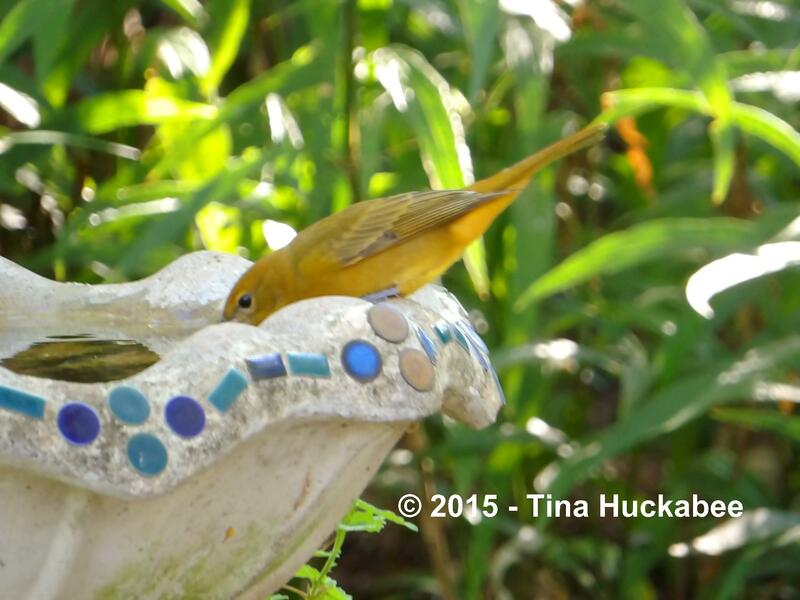 We had tanagers for the first time this year. I noticed their call and went straight to the bird book. You really did get some wonderful shots. Do you know that adverts pop up on your blog. They are directed at me So maybe it is a computer thing. Really!! Oh, that’s great, Jenny. They do have a distinctive call, not frequently heard. I know that the advertisements are there–I could upgrade and ditch them, but haven’t. Just lazy mostly, You’re not imagining things–Wordpress, like Facebook follows what you look and and throws advertising to you that might appeal. Always remember with these companies that you’re the product, not the customer. Let’s hear it for the invasiveness of technology. Such beautiful birds but how frustrating. Too bad they couldn’t focus on those nasty yellow jackets, instead. I’ve never seen tanagers here. Yes, it is a little bit sad on a personal level for me, but in the bigger picture, it makes sense that there would be birds that hunt certain pollinators. 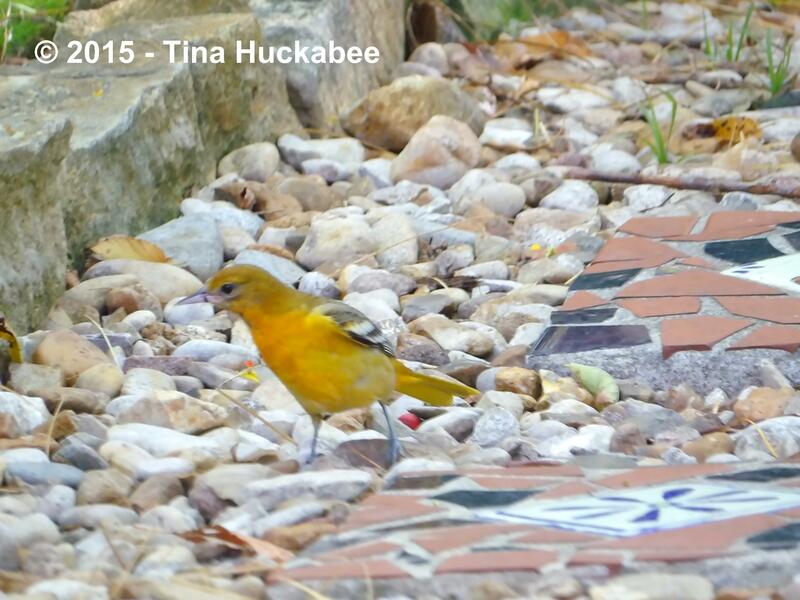 As I’ve stated before, bees and other pollinators are at much greater risk from herbicide/pesticide use and habitat destruction than they are from the tanagers. I think their range is probably too far south for you to see them in your garden. LOL. 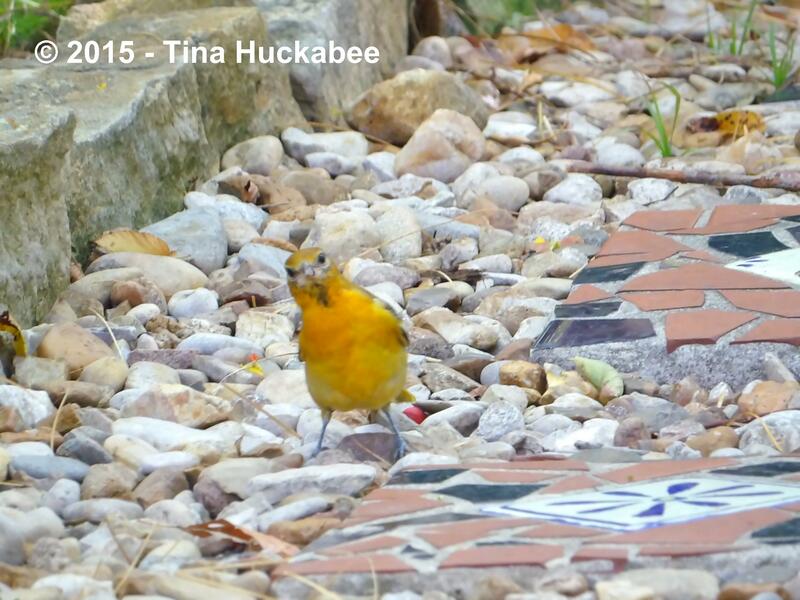 I didn’t realize honeybees were a favored food for the Tanagers. How interesting. Great photos! Presumably Mother Nature has designed this bird so it doesn’t get stung, when eating Bees and Wasps, I wonder if all birds could eat Bees and Wasps, if they were big enough? Lovely photos Tina and a bird I did not know about before. Julie, after they’ve sufficiently bonked the bee on the branch, they pull out the stinger apparently. I didn’t know about these particular birds either until last spring; so interesting, aren’t they? 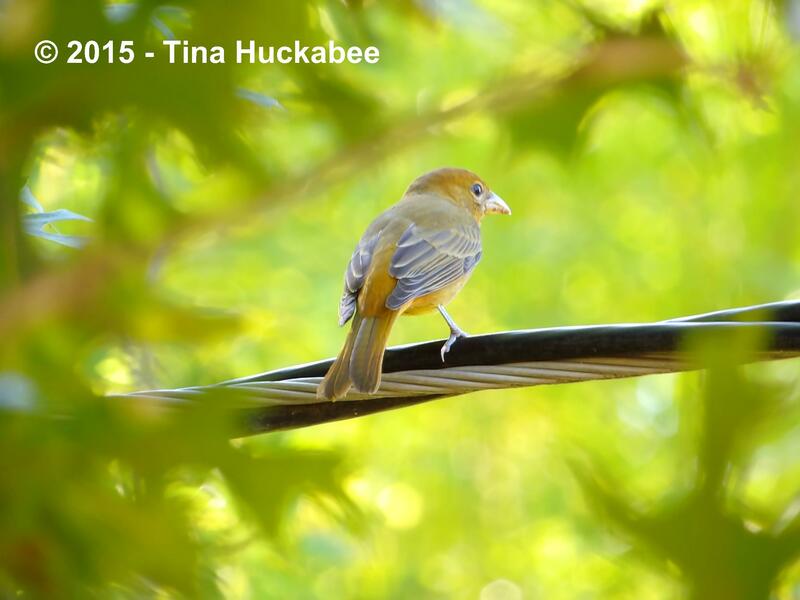 Your photos of the summer tanagers really bring out their character. They look like cheeky risk-takers (bit like house-sparrows here). Good thing their season sounds short though! I think they are cheeky. I just love the quizzical looks they employ and they seem to have lots of personality. I imagine that they hunt the bees all along their migration path, though I only saw them in the spring and now. We have bee eaters here too, but different to yours, ours are green, brown and iridescent blue, they are Merops apiaster. In reality our fly high in the sky so I think they eat more other insects rather than bees. I Googled your gorgeous bee eaters! Wow! And they’re similar in that they are migratory and seem to go back and forth from Africa to Europe and then back again–a similar life cycle to ours. Our Tanagers also eat fruit too and I bet they wouldn’t be adverse to a nice moth or butterfly, now and then. You are indeed lucky to see these beauties as they feast there…. Yes, I feel fortunate to observe these interesting birds, Donna. Wow. These are outstanding photos! You really capture the beauty and character of these birds. I am sorry to hear they eat your bees. It is a good thing they only visit for short periods of time. That’s funny about the ad thing. They have never popped up for me and I check for your blog every few days. I use Firefox which allows me to turn off tracking and disallow popups. Or it could be a total fluke. Awe, thanks Debra! They are quite charming birds, though I suppose my bees would disagree. It is funny and a bit scary about the ads, but it’s how this business works. I imagine that by turning off your pop-ups, you’re immune. Folks don’t realize just how much they’re watched by private entities in order to sell stuff. Ah, the American way! You should see the male! They are all gorgeous these birds and I do forgive them for eating my bees. Sort of. 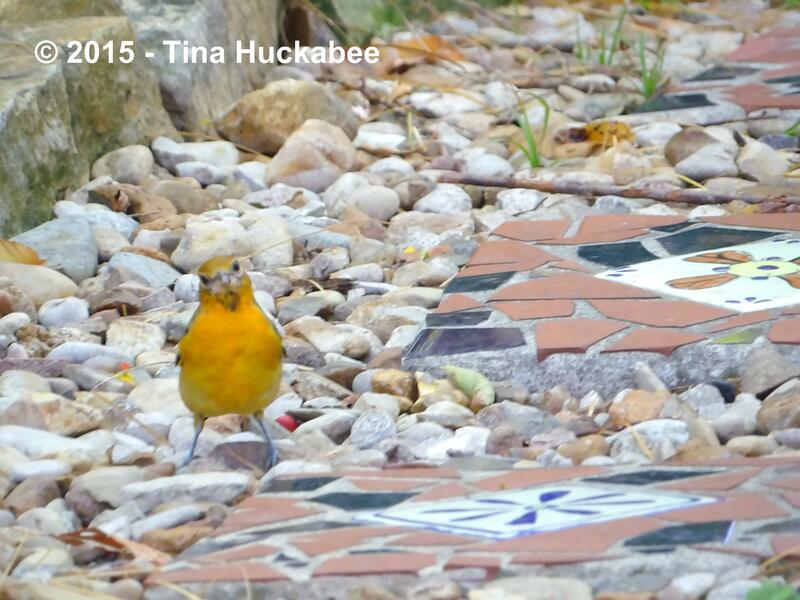 The bird on the path looks like she was trying to figure me out–they have funny little expressions, these tanagers. As you know well, it’s the balance of nature–seemingly cruel, but appropriate in its complex web.